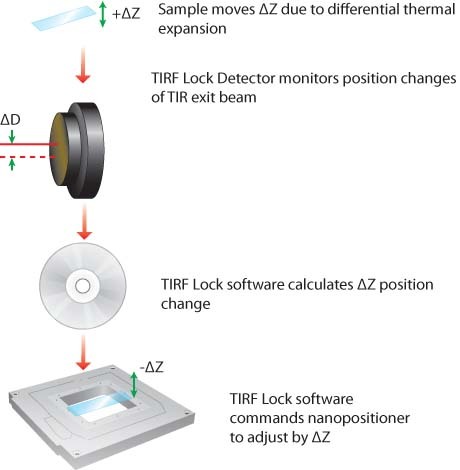 After the user sets up TIR illumination and establishes the desired sample Z position, TIRF Lock™ keeps the sample in the focal plane by measuring the displacement of the exiting TIRF beam and maintaining that position via software feedback. The TIRF Lock™ system includes a quadrant photo-diode (QPD) head, a TIRF Lock™ controller, and a LabVIEW based VI. 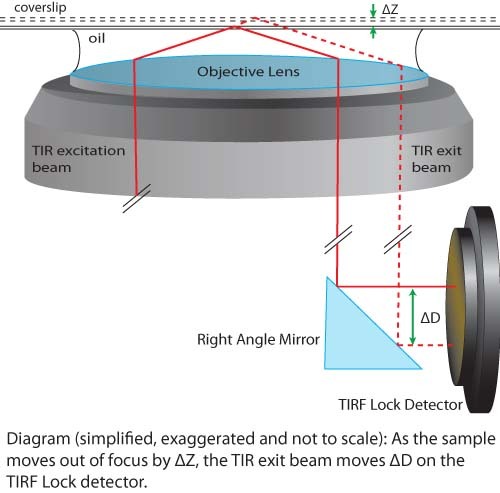 The TIRF Lock™ system is compatible with Mad City Labs RM21™ microscopes, the MicroMirror TIRF system, and the TIRF Module. As shown in the diagram above on the left, a small change in Z position of the sample due to differential thermal expansion in the microscope will result in a small change in position of the exit beam on the detector. The software uses that change in position to calculate an opposing change in the nanopositioner Z position, as shown in the schematic above on the right.